US President Donald Trump has claimed credit for the pressure being placed on Qatar by Gulf neighbours who accuse it of supporting terrorism in the region. He said his recent visit to Saudi Arabia was "already paying off" and the development might mark the "beginning of the end to the horror of terrorism". Saudi Arabia, Bahrain, the UAE, Yemen, Libya's eastern-based government and the Maldives have all cut diplomatic and other ties with Qatar. Qatar strongly denies the allegations. Mr Trump's recent speech in the capital Riyadh, in which he blamed Iran for instability in the Middle East and urged Muslim countries to take the lead in combating radicalisation, is seen as likely to have emboldened Gulf allies to act against Qatar. "During my recent trip to the Middle East I stated that there can no longer be funding of Radical Ideology. Leaders pointed to Qatar - look!" Mr Trump tweeted on Tuesday. He later tweeted: "So good to see the Saudi Arabia visit with the King and 50 countries already paying off. They said they would take a hard line on funding... extremism, and all reference was pointing to Qatar. Perhaps this will be the beginning of the end to the horror of terrorism!" I'm flying through the Gulf: How will this affect me? Qatar is home to the biggest US military air base in the Middle East, with about 8,000 personnel based at al-Udeid. The official statement from White House spokesman Sean Spicer said the US was in communication with all parties "to resolve issues and restore co-operation". "The US still wants to see this issue de-escalated and resolved immediately, in keeping with the principles that the president laid out in terms of defeating terror financing and extremism," he said. In the same week as Mr Trump's Riyadh speech, Egypt, Saudi Arabia, Bahrain and the UAE blocked Qatari news sites, including Al Jazeera. On Monday, Saudi Arabia, Bahrain, and the UAE gave Qatari nationals two weeks to leave, banned their own citizens from travelling to Qatar, and cut all transport links. Saudi Arabian Foreign Minister Adel al-Jubeir said on Tuesday that the economic measures should persuade Qatar to change its policies and behave "like a normal country". Speaking in Paris, he called on Qatar's rulers to end their support for the Muslim Brotherhood, the Palestinian militant group Hamas and what he called "hostile media". "We believe that common sense and logic and will convince Qatar to take the right steps," he said. The emir of Kuwait - one of the Gulf countries not involved in the dispute - travelled to Saudi Arabia on Tuesday in an attempt to mediate. He later left after a "brotherly visit" but there was no word on the outcome of the talks. 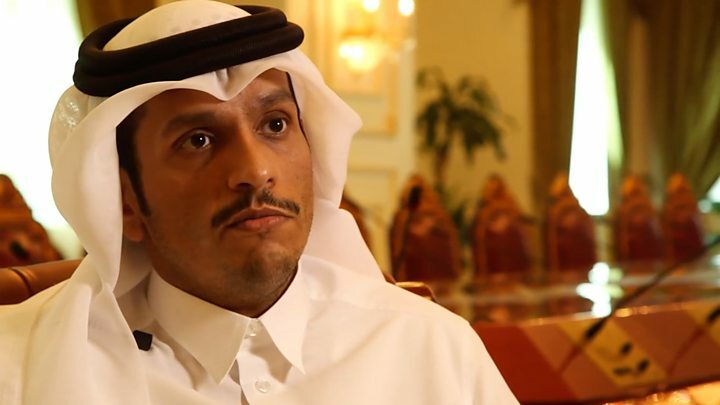 Qatari Foreign Minister Sheikh Mohammed Bin Abdulrahman al-Thani told Al Jazeera that his country would not retaliate but was unhappy with regional rivals "trying to impose their will on Qatar or intervene in its internal affairs". He told the BBC that Qatar was well prepared to withstand a "blockade", but also complained that the people of Qatar were the victims of "collective punishment" by other countries. The foreign minister said his government had told President Trump during his Middle-East trip that there was no evidence that Qatar was supporting radical Islamists, adding that the claims were based on "fabricated evidence and lies". To be clear, when it comes to terrorist financing, nobody's hands are clean. The Qataris, Saudis and Kuwaitis have all funded extremists in the Syria conflict. All have pulled back from that under US pressure. But Qatar's dealings are arguably murkier than the others because it likes to see itself as a neutral player that can act as an intermediary, and is thus willing to play both sides - Saudi Arabia and Iran. Whatever the case, the Pentagon doesn't share Mr Trump's tone of triumphalism. Qatar hosts America's biggest Middle East air base, the nerve centre for the air campaigns in Syria and Iraq against the Islamic State group. So far officials say operations have not been affected, but they might be if diplomatic feuding continues amongst US Arab allies. What steps have been taken against Qatar? The states that joined Monday's move against Qatar, a tiny but gas-rich peninsula, include some of the biggest powers in the Arab world. Saudi Arabia, Bahrain and the UAE closed all transport links. Disruption to airspace in the Gulf began on Tuesday morning local time. Doha, Qatar's capital, is a major hub for international flight connections. Airlines affected include Qatar Airways, Etihad Airways and Emirates. 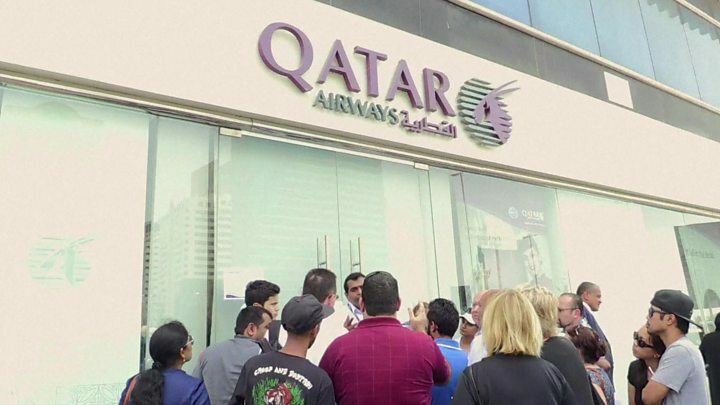 Saudi Arabia and Bahrain have revoked the licences of Qatar Airways and ordered its offices to close within 48 hours. When avoiding Saudi Arabia, their massive - and only - neighbour, Qatar's planes are having to take more indirect routes, leading to longer flight times. In a country reliant on imported food, residents have started to stockpile. A substantial amount of Qatar's food is transported across the border from Saudi Arabia, which is being closed. That is also an important route for construction materials - needed for the energy industry and for the preparations for the 2022 football World Cup. Qatar's exports are dominated by oil and gas. They are mostly seaborne, so should not be immediately hit, but the general economic disruption could have an impact if the dispute drags on. That possibility pushed the price of crude oil higher, but only briefly. Qatar is a member of the exporters' group Opec and the dispute could yet undermine the organisation's efforts to raise prices by restricting production. Why did this come about? While the severing of ties was sudden, tensions have been building for years and particularly in recent weeks. Broadly, two key factors drove Monday's decision: Qatar's ties to Islamist groups, and to Iran, Saudi Arabia's regional rival. Wealthy individuals in Qatar are believed to have made donations and the government has given money and weapons to hardline Islamist groups in Syria - Qatar says this is not the case. The Financial Times also reports that Gulf allies were angry that Qatar had paid a $1bn (£773m) ransom to jihadists and Iranian security officials after Qatari nationals were kidnapped in Iraq and Syria. Is Saudi to blame for IS? Saudi Arabia, too, has been accused of funding IS, either directly or by failing to prevent private donors from sending money to the group - allegations it denies. Qatar row: What's caused the fall-out between Gulf neighbours?